I’m supposed to get 6 Mb/s download speed. Yeah, perhaps at 3am when nobody on the west coast is using their computer. But at 10pm, I get .52 Mb/s? That’s nuts. This speed is less that half of the global average. 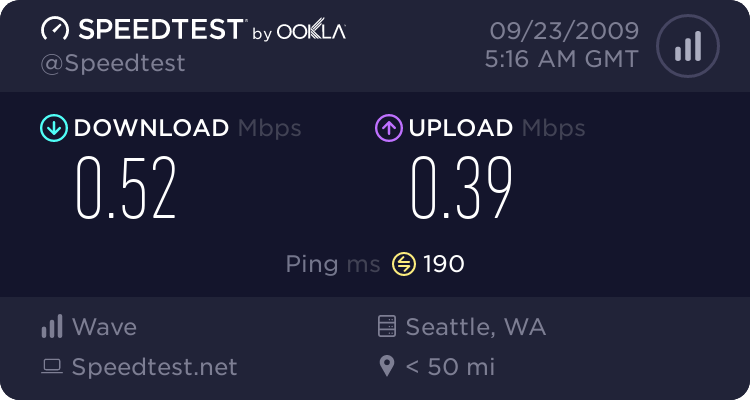 Perhaps I should dust off an old dial-up modem… I might just be better off using that. Digital life can be so unfair. Why do I have to live in a neighborhood that doesn’t have FIOS. I’d be quite happy with Comcast for goodness sake.